You might ask, what does mobile computing have to do with project management? The answer is LOTS. Projects create and maintain a calendar of events. Keeping these synchronized with your other projects, business meetings, your personal tasks, and having them handy where ever you go is a very good thing for your sanity and your project’s success. Currently I use iCal on my MacBook as my primary desktop calendar. I synchronize it to Google calendar via BusySync. I have multiple Google calendars, home, business, and social group. These all sync between my MacBook and Google. I do provide some sharing of my Google calendars. Interestingly enough, I can connect the Motorola Q to my MacBook via Bluetooth, treating it as a drive, and easily move pictures from the phone to the Mac. This is my preferred way to get pictures off my phone. Hmm, I should try it to get files ON my phone…. It does operate over Internet- no Bluetooth connection needed. This alone saves me a step and potentially a lot of time since I don’t have to reboot the phone if I’ve run the browser. The free version only does calendar syncing. To sync contacts I need to upgrade to the Premium account and spend the 19.95£ annually. 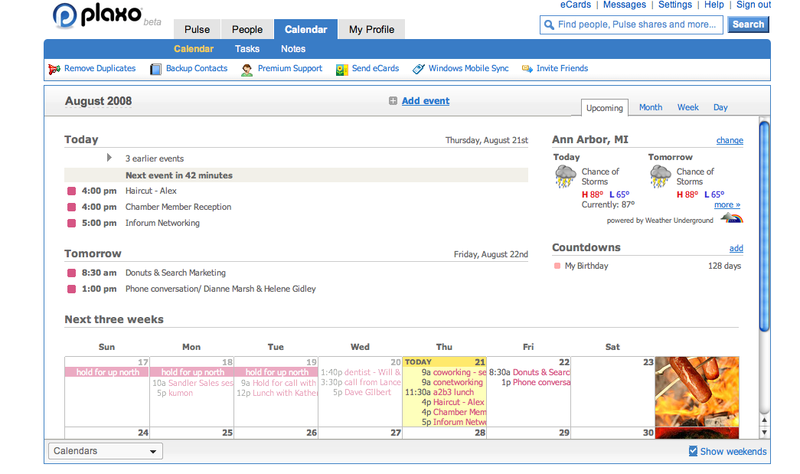 The social network Plaxo provides a synchronizing service between Google’s calendar, iCal, and Windows mobile devices. The Google calendar is free. Synchronizing to the Windows mobile device costs $49.95 a year – a bit steep for me. However, Plaxo’s calendar display is VERY NICE. The Upcoming tab has the best user interaction of all the calendaring tools I’ve used. See screen shot below. You see a three-week block view with clickable events to view the full text. Being a visual person, I like seeing the information in block form. The most useful tool, however, is the information of what is coming up next. I get a gentle countdown of what appointments are coming up TODAY in the top part of the window, a view of what tomorrow’s appointments are in list form, and countdown to my own birthday (yeah!) as default, ability to add others, and the weather for my area today and tomorrow. The screen shows enough white space to make the calendar easy to read while providing all the information. In summary, I’m seeing more and more people using Google calendars as either a primary or a holding place, sharing them between families and social groups, and work project teams, and synchronizing these to their handhelds and desktops. The synchronizing tool is more based on what desktop and phone device they have (Mobile Me for iPhone/iTouch, GooSync, Mark/Space, Plaxo, and Blackberry sync tools for others). How are you keeping yourself synchronized?